We’re lucky enough to have a celebrity guest blog today from none other than my wife (Clay’s Mom, typing partner and number one fan) Roe DeLuca, who is holding down the fort in more ways than one while I’m off in exotic lands—well, Connecticut—at another speaking engagement. If you’ve been reading “Life With Clay,” you know that supported typing has opened up Clay’s world—and it’s giving us snippets of insight into a young man who is intelligent, aware and soulful. The other day was a different story. It was one of those “sad days” Clay sometimes refers to, highlighted by an afternoon of intermittent crying and frustration. Advil helped take the edge off, but it wasn’t enough to bring back the dude who laughs every time I turn “Marvin K. Mooney Will You Please Go Now?” into a rap song. His answer took my breath away. “Stay strong,” he typed back. I stood there mouth agape while Clay galloped off to his bedroom. In just two words, my so-called non-verbal son said more than most people twice or even four times his age. Clay is painfully aware that he sometimes doesn’t make life easy for those around him. But if you take the time to really think about it, you will see that this is just a small part of him. Clay has taught me so much more than patience; with his quiet presence, he has shown me a deep love that I never thought imaginable. It was clear to me that I needed Clay’s wisdom as a constant reminder. A quick search on Google, and I found a lovely silver bracelet that is perfect. So Lar, not only do you have a blog posting but a Christmas present suggestion! This entry was posted on December 8, 2010, 4:03 pm and is filed under Uncategorized. You can follow any responses to this entry through RSS 2.0. You can leave a response, or trackback from your own site. Thanks, Merle. We’ll have to get together soon! 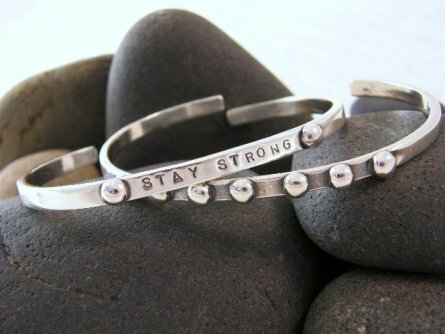 I am going to order the bracelets. I’ll email you privately, too, but great to hear from you, Lydia. If you’re getting the bracelets, check out Curiosities. They’re much cheaper than Toby and Max. We’re thinking of offering them on “Life With Clay” as a fundraiser. What a gift this communication device has been for the family. Wishing you many more insights to come. Happy Hiolidays! I just found this blog (and thank you for listing me on your blogroll BTW!). I was thrilled to read your more recent posts about the typing. Our seven-year-old is non-verbal but beginning to type a few words without prompting, and I am so hopeful that will be his means of communication in the future. I always worry he won’t make the leap from my prompting to his communicating spontaneously, but hearing your story with Clay gives me some hope. Thank you! Thanks for sharing your thoughts. As you can see from the blog, Clay’s journey to type over the past year has had its ups and downs. There are days when he can’t get it together to respond beyond yes or no, and there are days when he is cruising. Hang in there. Clay is not yet initiating typing on his own, but the support he needs has become less and less. It is a long journey. The reservoir of thought and insight we keep finding in our little guy and his noticeable jump in self-esteem has made it all worthwhile.